A guide to selecting control, diluent and blocking reagents. Experimental protocols using immunotechniques can often be improved through the optimal use of blocking reagents, diluents, and controls. Read more to learn about how to select appropriate diluents and blocking steps to abrogate unwanted background, and how experimental controls can help identify the source of the off-target signal. When developing an immunotechnique it’s important to consider how the results will be interpreted. Even the simplest assay can benefit from the addition of the correct blocking reagents and experimental controls. The inclusion of positive controls may be important if the images are to be used in publication. Depending on the technique employed, it may also be useful to add tissue and reagent controls. Diluent composition may also influence assay performance. Here we detail a selection of common problems that can be solved with appropriate blocking, diluents or control reagents. Use appropriate blocking reagent to block membrane prior to incubating with primary antibody. Normal serum (5% v/v) from the host species of the labeled antibody (learn more here), or BSA (IgG- and protease-free) learn more here. Avoid using milk or BSA if using primary antibodies derived from goat, horse or sheep. Bovine IgG may interact with the antibody due to homologous epitopes of closely related species. 5% v/v normal serum from the host species of the labeled antibody (learn more here). To avoid detecting IP antibody heavy chains at 50 kDa probe blot with conjugated anti-Light Chain specific antibody. Anti-Light Chain antibodies (learn more here). To avoid detecting IP antibody light chains at 25 kDa, probe blot with conjugated anti-IgG, Fc fragment after blocking with monovalent Fab fragment anti-Fc. Anti-Fc antibody (learn more here). Fab fragments (see protocol here). Use an isotype negative control (non-specific IgG from the same species as the primary antibody) to demonstrate specific binding of the primary antibody. ChromPure proteins (learn more here). Block endogenous binding sites which may interact with experimental reagents. Normal serum from the host of the labeled antibody (learn more here). Utilize Fab fragments in suggested protocols to accomplish multiple labeling. Fab fragments (see protocols here). Immunolabel primary antibody prior to incubation. Inactivate endogenous peroxidases with hydrogen peroxide. Read our Western blotting troubleshooting guide for more information here. Inactivate endogenous phosphatases with levamisole. Incubate with streptavidin, followed by free biotin. Include detergent in buffers, optimize salt concentrations and pH. Tween 20 and/or Triton X-100. Background from antibodies binding Fc receptors. Normal serum from the host of the labeled antibody (here) For more information see Technical – flow cytometry here. Use F(ab’)2 format secondary antibody to avoid entrapment by Fc receptors. Use appropriate blocking reagent to block wells prior to incubating with the primary antibody. Normal serum (5% v/v) from the host species of the labeled antibody (here), or BSA (IgG-free and protease-free) here. Use a positive control to demonstrate activity of the labeled secondary antibody: coat with primary antibody isotype and detect directly with secondary. When using a labeled secondary antibody for detection, never block with normal serum or IgG from the host species of the primary antibody. If immunoglobulins in normal serum bind to the specimen of interest, they will be recognized by the labeled secondary antibody, resulting in higher background. 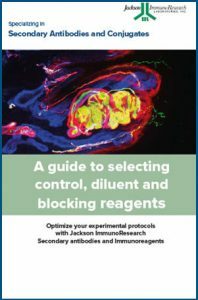 Jackson ImmunoResearch offers a wide variety of immunoreagents designed to improve assay performance and ease of analysis. Blocking reagents allow you to prevent background signal from endogenous proteins or non-specific interactions with substrates (e.g. ELISA plates, beads, tissue). Assay development and troubleshooting can be improved with the application of experimental controls. ChromPure proteins are primarily used as experimental controls for either primary or secondary antibodies. They are available conjugated to a range of fluorescent dyes and reporter enzymes, allowing the isolation of signal derived from non-specific interactions. ChromPure proteins are derived from the serum of non-immunized animals and do not recognize any known antigens. They are prepared using a variety of chromatographic techniques to yield material with no contaminating molecules observed up to a concentration of 20 mg/ml, making them ideal for use as experimental controls for the most sensitive of assays. ChromPure purified proteins may also be used as blocking reagents for Western blotting, IHC, and IF. Normal serums are obtained from non-immunized animals, and consequently, do not detect any specific antigen. Normal serum diluted to 5% (v/v) in PBS is strongly recommended as a blocking agent to reduce background from nonspecific, conserved-sequence, and/or Fc-receptor binding. Best results are obtained with diluted normal serum from the same host as the labeled antibody, used as a separate incubation step before addition of the primary antibody. Gamma globulins are derived from non-immunized animal serums and have been further purified by salt fractionation, ion-exchange chromatography, and gel filtration. Gamma globulins provide an inexpensive source of IgG with only trace amounts of other immunoglobulins and/or non-immunoglobulin serum proteins, and can be used as blocking reagents and as controls. Bovine serum albumin (BSA) is used extensively as a carrier protein to dilute antibodies and as a general protein blocking agent in immunoassays and immunodetection protocols. If BSA is the desired diluent or blocking reagent for your assay it’s important to know if the BSA is suitable for your assay. Not all BSA products commercially available are comparable. Most BSA products, including those marketed as having no detectable IgG, are contaminated with low levels of bovine IgG. The contaminating IgG shares many epitopes with goat, sheep and horse IgG, and can become a target for secondary antibodies directed against those species (an exception is bovine anti-goat IgG). This may occur with other antibodies that cross-react with bovine IgG as well. The interaction may result in loss of antibody activity, reduced antibody stability, and/or increased background. The background may derive from sticky soluble immune complexes or from non-specific binding from contaminating bovine IgG attracting cross-reacting labeled secondary antibodies. Jackson ImmunoResearch Bovine Serum Albumin is IgG-free and protease-free. It does not contain contaminating IgG, which alleviates common immunoassay problems such as background and reduced signal associated with many commercial high purity preparations of BSA. IgG-free BSA is supplied as a pure protein, freeze-dried from deionized water. Fab fragments can enable the blocking of endogenous immunoglobulins to reduce background staining, and can be used for multiple labeling assays when primary antibodies are derived from the same host species. Find out more about using Fab fragments in immunoassays. FabuLight antibodies are Fab fragment secondary antibodies specific to the Fc region of IgG or IgM primary antibodies. They are available conjugated with 9 different fluorophores and biotin, and enable labeling of primary antibodies prior to incubation with cells or tissue. This provides a time-saving alternative to sequential incubation flow cytometry and immunohistochemistry procedures, without compromising the active site of the primary antibody. FabuLights may also be used for labeling cell surface immunoglobulins without cross-linking and activating B cells, and labeling Fc chimeras (fusion proteins). FabuLights are not provided cross-adsorbed against other species, so blocking steps may be required to avoid labeling endogenous immunoglobulins. Find out more about FabuLight antibodies here.